A member of the Electoral College from Washington state went rogue Monday and voted for a Native American tribal leader from South Dakota over Hillary Clinton, who had won the state in the presidential election. By casting his vote for the tribal leader, the elector said he had hoped to shed light on the importance of protecting the environment and empowering indigenous people around the country. "What is bigger than all of this [election] is water," Robert Satiacum, a member of the Puyallup Tribe in western Washington, told ABC News. Satiacum had publicly stated for weeks that he did not plan to vote for Clinton. But once he was in the room with the other electors, he came up with the idea of voting for Faith Spotted Eagle. "The world is on fire, we need first responders," he said. 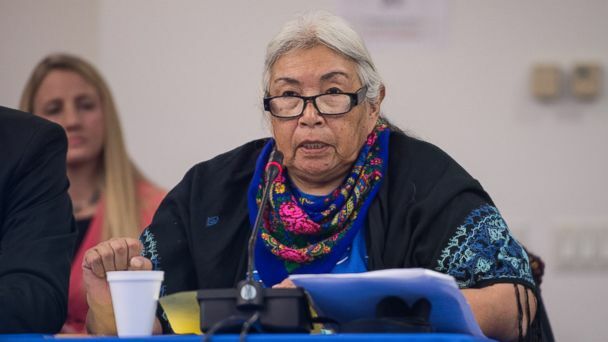 "Faith Spotted Eagle is committed to the Earth. She is the air, she is the land and the water ... she cares about my mother, your mother, this Earth." Satiacum met Spotted Eagle, an elder with the Yankton Sioux Reservation, when he visited the large Oceti Sakowin Camp on the Standing Rock Sioux Tribe's reservation in North Dakota earlier this month, where thousands of indigenous people and environmental advocates have gathered in opposition to the Dakota Access pipeline. The $3.8 billion project, if completed, would carry 470,000 barrels of oil a day over 1,100 miles from North Dakota to Illinois. Its proposed path has several river and waterway crossings, which area tribes say threaten their land, water and sacred burial grounds. The tribes are currently locked in court battles with Energy Transfer Partners LP, the company building the pipeline. Earlier this month, the Army Corps denied an easement that would have allowed the Dakota Access pipeline to cross under Lake Oahe in North Dakota. Spotted Eagle has been a vocal leader in the fight against both the Dakota Access pipeline and the Keystone XL. She said the news of the Electoral College vote came as a surprise to her. "It is kind of like getting a big bouquet of roses," she told ABC News, adding with a laugh that her grandson now believes she is famous. But she said Satiacum's vote was about a movement larger than herself. She added that the national attention and support the Sioux tribes had received in their fight against the pipeline was due to people around the country awakening to threats against the environment. "The worst terrible thing in the world would be for your grandchild to ask for water and to not be able to give them water," she said. Satiacum passionately described the proposed pipeline as part of a "re-plumbing" of America "for profit." "Where are our advocates, where is our protection?" he said. "Why are our natural resources always being hunted?" According to a tally from The Wall Street Journal, only 85 electors since 1804 have voted for someone other than the candidate to whom they were pledged, and Satiacum was the first to vote for a tribal leader. American Indian and Alaska Native people account for under 2 percent of the national population, according to the National Congress of American Indians.